Create a farmhouse bedroom with a mix of antique farmhouse furniture and modern farmhouse decor! Since moving to the ranch, we have had the opportunity for many guests to come stay with us! This room has seen quite a few changes since we moved in, but I finally feel that this farmhouse guest bedroom is the perfect cozy spot for friends and family to stay! The room originally had purple carpet and yellow walls with a pink bathroom attached. It was very 1960s chic. To update this bedroom, we added crown molding, replaced the carpet with laminate flooring (shop our flooring here), and painted the walls a beautiful shade of gray (classic gray by benjamin moore). I was lucky enough to find a beautiful chest of drawers in a storage shed here on the ranch which was the perfect addition to this room. I hope you enjoy taking a tour through our guest bedroom and find my tips for creating a farmhouse bedroom on a budget useful! PS: Don’t forget to watch the YouTube video below for even more details! While I love a crisp white bedding set, using pattern and color is a great farmhouse bedding idea! Stripes, navy, and flax are all beautiful elements in a farmhouse bedroom that add a little character! 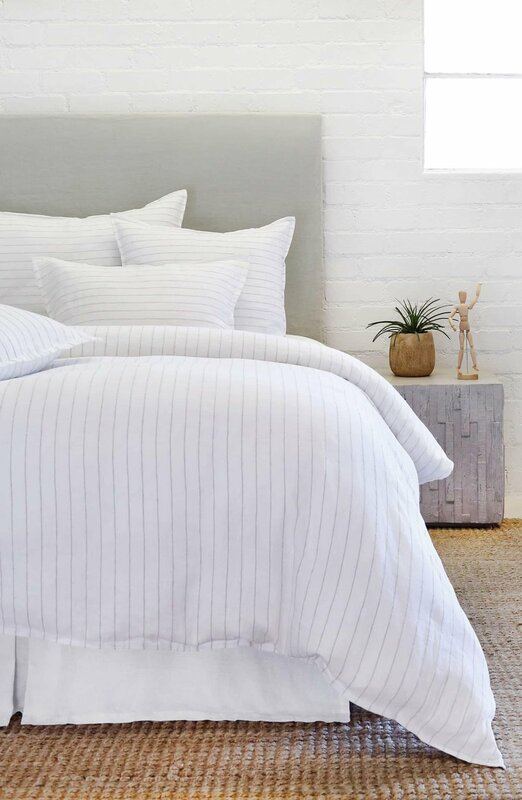 I love these striped sheets - it is the perfect farmhouse bedding for under $50! For a luxurious feel, linen textiles are my favorite for creating a farmhouse bedroom! You really can’t go wrong with linen, it is such a beautiful fabric. If you love the navy pillows I have in this bedroom, you’re in luck! You can sew your own linen pillows (a Pottery Barn copycat), and don’t forget to check out my tips for shopping for linen by the yard. Use a combination of colored and textured pillows for a beautiful farmhouse bed. When selecting pillows and throws, stick to a single color palette, or one with complimentary colors that you use often throughout your house. I love green, pink, cream, and blue. Whenever I want to freshen things up, I can rotate pillows and throws into different rooms. This instantly revives a room and is a great way to create the farmhouse look on a budget! I love finding ways to implement meaningful and inexpensive artwork! The art to the right of the bed is actually a set of vintage receipts I found at a flea market. The hand written numbers and French writing is beautiful and the set cost me about 1 euro each! To make the artwork feel more significant, use large gallery frames matted down to fit the art. You could use vintage prints, free printable graphics, or pages from a vintage magazine or newspaper! The art to the left of the bed is a blown up print of some of the original brothers from our ranch. This is true farmhouse artwork! I love that this is symbolic to our family and was a piece of artwork I found in our house when we moved in. You could recreate this look by blowing up an old family print and framing it with an inexpensive frame! An easy way to create a farmhouse bedroom on a budget! To create a farmhouse bedroom, mix metal and wood elements! Use crisp paint colors to create contrast between wall color and trim color. One of my favorites is Classic Gray by Benjamin Moore (walls) combined with Bistro White by Valspar (trim). Other popular farmhouse paint colors include: Pure White by Sherwin Williams, All White by Farrow and Ball, Shiplap by Magnolia, and Revere Pewter by Benjamin Moore. Source old furniture from your house first! Most of the furniture I have in my home was found in old storage sheds from around our house. Chances are you have friends or family with lots of old furniture stored away from past generations. Ask if you can pick through the things they aren’t using. They will probably be happy to see them in your home getting some love! Create inexpensive artwork! Use things like old receipts, vintage prints, free printable artwork, vintage magazine pages, or old photographs as artwork. Make them feel unique and special by matting them down in an oversized frame or blowing them up in black and white! Sew your own farmhouse bedding accessories! You can find great sheets for a budget friendly price tag, but to really make a bed feel cozy add some layers of pillows. Linen is a farmhouse favorite, but can come with a hefty price tag! Instead, use vintage linen table cloths or buy a few yards of linen and make your own farmhouse pillows! Find authentic farmhouse furniture at flea markets or craigslist. A lot of farmhouse furniture and decor can be found at budget friendly price tags on craigslist or flea markets. It just takes a little creativity to see past the dirt or original use. For example, old galvanized chicken feeders or rusty metal buckets make beautiful decor pieces! Adding bits and pieces of vintage farmhouse decor is a great way to create a farmhouse bedroom with an authentic feel. To keep things modern, it’s important to balance it out with minimal accessories. I advise finding a few key pieces. Wondering how to find authentic vintage farmhouse decor? Heading to flea markets is my favorite way to find farmhouse decor! Often times finding farmhouse furniture or decor online is expensive because of shipping costs. Picking through flea markets can turn up beautiful vintage decor! When you find something interesting, think of ways you can repurpose and reuse it in a new way!